Mixed Headstamps and may contain both brass and nickel finish. Brass typically ships either same or next day with an estimated arrival time of 2-3 days. .32 CAL (.312) 71gr RN 100 ct.
.44 CAL (.429) 240gr FP 100 ct.
9MM CAL (.356) 124gr RN 500 ct. I am impressed!! Excellent prices...rapid shipping....brass was shiny and clean...no aluminum cases and I found no split cases...again...every order I buy through Diamond K Brass has been top rate...I am impressed!! I am just an end user and I'm pleased that Diamond K will service shooters like myself that does not use up/lose a lot of brass but since I'm frugal....the end price through Diamond K is outstanding!! 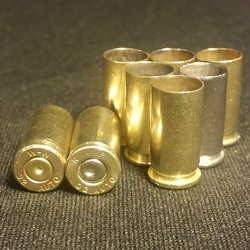 I do shoot a lot....upwards of 1,000 rounds per week and I'm bound to lose/use up brass and with that in mind...new brass/new ammo would curtail much of my shooting due to cost. I do cast my own pistol bullets....too bad that pistol powder is still scarce!! I could use a few pounds as I post. 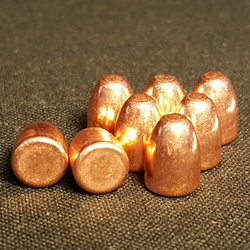 Ordered 4, 100 count bags of commercial .223 nickel plated casings to make up some varmit ammo. Didn't have any prep work done to Them. They arrived 3 days from date ordered. They were very clean and needed no tumbling. Very very pleased with the quality of the casings!!! The shipping was the fastest of any vendor that I've ordered from in many years.. These folks are my new go-to company for all my brass and tumbling supplies. Price is right and shipping is extra speedy! Can't beat the quality of the brass. I've been reloading .217 berdan primed brass for my 30-06 for the last few years and was real happy to come across Diamond K Brass during a search. Purchased a 100 pack along with some 7.62x54r and was real happy with their product. The 7.62x54r had both sizes of berdan primers, .217 and .240, both of which I reload. Good to see they provide berdan brass to those who reload it. All the brass is tumbled, looks good and reloads fine. Very happy with their service, got the order within 3 days. Will be placing a second order when I'm ready for more brass. I made my first purchase this week. The products showed up very promptly, the .45 brass was in great condition. The 223 brass actually appeared to have been polished although I didn't specify that I wanted it. The bullets were very reasonably priced and much to my surprise, they were a brand name bullet that I use all the time and the price was much lower than one of the national mail order stores. I'll be back! I ordered 2000 .223 dirty - I received 2000 + rounds of .223 clean as a whistle. The invoice said "free polish" What a very nice and much appreciated surprise. They were packaged extremely well and shipping was very quick. This was my first order but will not be my last from Diamond K that is for sure. Just a note - when I emptied the brass into my containers, there was not one speck of dust/powder residue in the bottom of the clear plastic bag the brass was shipped in. It was perfectly clean! So what little they charge, I will always ask them to clean as it was a top notch cleaning job to say the least. Very satisfied customer! I have made several purchases or brass and projectiles from Diamond K and am absolutely, perfectly satisfied in every way. 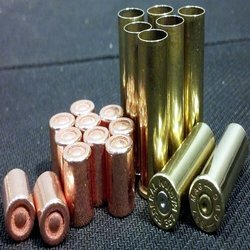 I would not even consider a brass purchase from any other source. If an error occurs (RARELY), their customer service is MORE than satisfactory. They more than compensate for any inconvenience to the customer and are ALWATS prompt and courteous. ALWAYS!